I was contacted by K.N. Lee herself to read and review her book. Imagine how excited I was that someone wanted me to read their book! I have been contacted before and had to pass up the opportunity because I didn’t want to come across as a bad person as the book was no interest to me. But Netherworld was right up my alley. It was about vampires, and if you have not been reading my blog for a while it’s time that you learn how much I love vampires. If there are fangs involved I will jump on it in a heart beat. Believe me, I have been let down a few times because of my quick action. I owe the author a quick apology for taking so long to review the book. But on to the review! Koa is a vampire…at least half vampire. Her father was a vampire and her mother was a human. She is also a vampire hunter, ridding the world of vampires that take advantage of their position. Years ago, years that Koa can not remember, her father was killed and her mother was cursed, and lives her days as a cat. Koa has a friend that watches over her, a fallen angel who is also her boss. 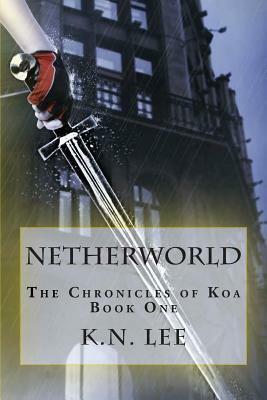 Koa is on a quest to find out what happened to her, why her memory has been erased and why there are people after her. I thought the book was interesting. It was a fascinating world that Lee has created, but it did not draw my in immediately. It took a little time to get into the book, and I was several chapters in before it really hooked my attention. Don’t get me wrong, it’s not a bad book. It keeps you guessing the whole time, trying to figure out what is going on and where the story is going. I did notice a few errors, but nothing that would really distract you from the story. Actually, it was no more than what you would see from your favorite author, I have just started noticing errors in books a lot more recently. Overall, the story was entertaining and I enjoyed the book. The beginning is not boring, just a little slow. My only complaint was the ending. I understand that a book that is part of a series needs to have something at the end to bring the readers back. But, the way this book ended was almost annoying. There was no closure to the book, it ended like a chapter would end, only there was no following chapters. I would have jumped right into the next book if I had the money, but my finances are a little low at the moment. It’s actually eating away at me to know what happens next, so the second book is on my reading list. I just hope the second book does not drop off in such a cliff hanger that causes me to curse and want to throw my book across the room. The books are rather cheap and I don’t feel like it would be a waste of money to read. Just beware of the ending. The horribly annoying ending that still makes me growl at the author. Find out more of K.N. Lee and her other works here. Should you want me to read your book for a review, go here and send me an email. I check my emails daily.